This story is part of an occasional series. Twins, once a rarity to marvel over, are now a common part of American culture, thanks in large part to increased use of reproductive technology. Twins are conceived naturally just 2 percent of the time; for those who get pregnant with fertility treatments the rate is more than 40 percent. But as adorable as many of us consider twins, this dramatic rise poses serious health risks, and there are mounting efforts to curb it. 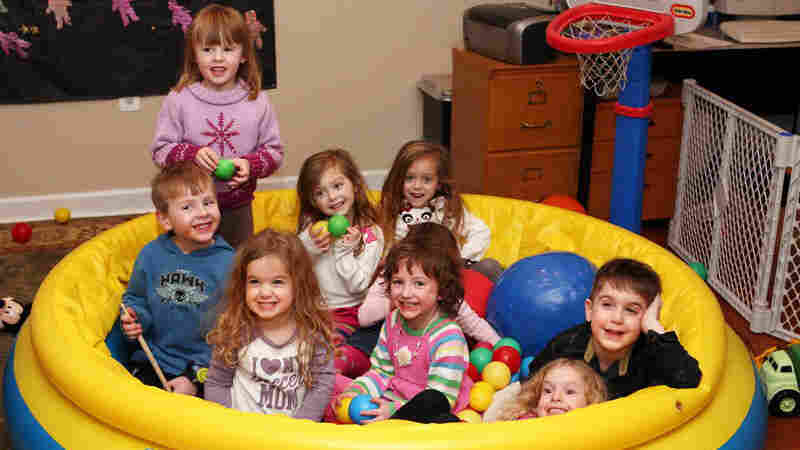 In a Maryland basement, five sets of 4- and 5-year-old twins clamber among a sea of toys at a party/play date their mothers call a "twinapalooza." Sharon Bernstein says matching outfits and double-everything do turn heads. "Women always say, 'Oh, you're so lucky you have twins! I wanted to have twins,' " she says. "And I always go, 'Are ya crazy?!' "
Three of these mothers, including Bernstein, used fertility treatment. What they acknowledge, looking back now, are the incredible risks they took in their drive to become parents — risks that posed a danger to themselves and their children. "I was so focused on just getting that positive pregnancy test. I really couldn't think past that event," says Bernstein, who struggled through many years and multiple rounds of in vitro fertilization, or IVF, trying to conceive. "But as soon as I was pregnant it was like, 'Now what?' The risks and the downfalls of a twin pregnancy? No, that was completely a blindside." Since 1980, the rate of twin births has jumped 70 percent, according to the Centers for Disease Control and Prevention. In fact, more than 3 percent of all babies born in the U.S. are now twins or higher order multiples. Two-thirds of this increase is due to fertility treatments, while the other third is because many more women over age 30 are having babies. The female body normally releases one egg per month, but as women age, hormonal changes make them more prone to release two eggs. Limiting the number of embryos used in IVF would only go so far in bringing down the twins rate, as many or more multiples result from other kinds of fertility treatment, such as intrauterine insemination, that are not so easily controlled. What if far more women avoided having twins by using only one embryo in in vitro fertilization? That's what Dr. Maurizio Macaluso, who until recently headed the CDC's fertility branch, asked an economist to consider. "The calculated costs savings were in the hundreds of millions of dollars per year" for patients, insurance providers and employers, Macaluso says. The CDC and Aetna insurance are working to educate patients and promote this "single embryo transfer." Yet the downfalls are well-documented. The human uterus is designed to carry one baby. When it's stuffed with two, any number of things can go wrong, and odds are good that the babies will be born prematurely. "When they transferred the embryos one of them implanted in a very bad spot," says Bernstein. "There weren't enough blood vessels. So I was on bed rest for 10 weeks." She delivered her daughters frighteningly early, eight weeks premature. One weighed less than 2 pounds. Stacey Tyser conceived her twins naturally, and also recalls the anxiety of her pregnancy. "Within the four weeks before my twins were born I was in and out of the hospital," she says. "I can't tell you how many nights I spent there." All that, plus her C-section, plus the time her premature twins spent in neonatal intensive care (six weeks for one, nine weeks for the other), also added up to some unbelievably big bills. "Everything was over $600,000," she says. It was thankfully picked up by the insurance company. "The cost to the system is enormous," says Barbara Collura, executive director of Resolve: The National Infertility Association. Collura advocates for patients, and lobbies insurance companies and employers to cover fertility treatments, so she admits to feeling some responsibility for the burden twins are putting on the health care system. To be sure, most twins end up fine. But because 60 percent are born premature, many do not survive, Collura says, and others face a lifetime of problems: developmental, cognitive, respiratory, digestive, trouble with sight and hearing. Twins are far more likely to have cerebral palsy. "Doctors know that," she says. "Neonatologists know that. Pediatricians know this. OB-GYNs know this. Everybody knows this, except for the patients." Yet it's the patients who make the crucial decisions in fertility treatment. And in the case of IVF, twins are entirely avoidable. At more than 400 fertility clinics across the country, clinicians have become adept at choosing the most viable eggs and sperm to combine and coaxing them to produce that miraculous nugget of life, the embryo. This makes a difference when it comes to deciding how many embryos to transfer, or put into a woman's uterus. "Ten years ago, we would hedge the bet," says Dr. Robert Stillman, medical director at Shady Grove Fertility Center in Rockville, Md. "The likelihood of any one embryo implanting and bringing about pregnancy was low enough that you could put two or three or four, and most of the time you didn't get multiple pregnancies. But now, as the pregnancy rates per embryo have so increased, now you have to put far fewer." Accordingly, in recent years, guidelines set by the American Society for Reproductive Medicine have grown more conservative, and the rate of triplets and higher order multiples has plummeted. Yet the twins rate has remained stubbornly stable. The ASRM recommends using just one embryo for many women undergoing IVF. But many doctors may not push that forcefully. And Stillman says those who try may have trouble convincing someone desperate to become a parent. "We always feel like we're at loggerheads with the patient," he says. "We get pushback every day, every single day." One big reason is money. IVF costs anywhere from $12,000 to $15,000 or more for one attempt, and it's not covered by most insurance. Like anyone who gambles, patients can be seized with a sense of all or nothing. Stillman also finds an alarming shift. As more people see twins all around, patients show up at clinics thinking they'd like twins, too. But he says they're only seeing the happy, healthy twins. "I think if they saw the twins instead of in the park near their home, [if they] saw them in the intensive care nursery, or in the special needs educational fora, they might think differently," he says. "And that's a tough message to give to somebody who's just trying to have a family." "I decided to do two. It didn't even occur to me to do one," says Julie, a soft-spoken 37-year-old single woman who spent nearly a year trying to get pregnant. She doesn't want to use her last name to protect her own privacy and that of her unborn children. Julie was inseminated five times with donor sperm, to no avail. Then followed a failed round of IVF. By the time of her second IVF, she figured she'd never get pregnant. When her doctor said she'd have nearly the same chance with one embryo as with two, she says it just didn't make sense. "It's a really emotional process and you invest a lot, and it's frustrating, and it's hard," she says. "It seemed intuitive to me that there was a greater chance with two. So if I'd only transferred one and didn't get pregnant, I think I would have regretted not having transferred two." Now Julie is five months pregnant with twins. She's a doctor herself, so she says she understands the risks of a twin pregnancy and prematurity. She vaguely remembers her fertility doctor talking about them. "I could have asked," she says. "I asked lots of questions. But I wasn't concerned about that." Julie's friends all said if they were in her place, they'd transfer two embryos, too. In fact, two good friends have twins. Julie feels confident she can handle two, and she's excited about it. "I'm someone who wanted more than one child," she says, "and I would have wanted to have a second child anyway. So, it means I won't have to do this again." Stillman says he understands all this, but it doesn't change his message: It's safer to have one baby, and using one embryo in IVF has nearly the same success rate as two. So if even informed women like Julie have what Stillman calls "some level of denial," what to do? For one thing, punch up the message. Stillman is teaming with the advocacy group Resolve to put their warnings in a patient's voice. Soon, every IVF patient at Shady Grove, the nation's largest fertility clinic, will be required to watch a video based on the disturbing, true story of a former patient. Her twin girls were born at 25 weeks, and the video describes how one twin had intestinal surgery, how both spent the better part of seven months in a hospital and how impossibly difficult the whole experience was. This mother wrote her fertility doctor, asking the clinic to please share her story, so that others might think harder about the risks of twins. Patients will watch the video on an interactive computer, clicking to answer questions. "There is well-known information that patient education can play a role," Stillman says. "The more education, the fewer embryos transferred." There are also efforts to take on that other huge problem: the $12,000 to $15,000 price tag of IVF. Most patients must pay out of pocket, but even those covered by insurance face limits that can pressure them to take risks. So the insurance company Aetna started a new program last year. Joanne Armstrong, Aetna's senior medical director, says women who agree to transfer just one embryo, get a two for one. "If they voluntarily try it, and they are not successful, the embryos that were created but not used — i.e., put back in the freezer — can be used then in a subsequent cycle," Armstrong says. That is, a free second single embryo transfer. The savings for Aetna are clear — another IVF is nothing compared with the enormous expense of premature twins. What do the mothers at the Maryland play date make of all this? Sharon Bernstein says she wouldn't trade her twin girls for anything. But she believes the push for one embryo makes sense. "I think if I were starting now, and I saw that there was a lot of success, I would absolutely try it," she says. If more women did, experts say, it would save hundreds of millions of dollars a year and untold heartache for families. Previous audio and Web versions of this story misidentified one of the mothers of twins. We identified a speaker as Donna Shimshi. In fact, it is Stacey Tyser who had repeated hospital stays and a $600,000 bill. While others in the story had undergone fertility treatment, Tyser conceived her twins naturally.